Fans of Buddy Guy's releases of the past decade or so might be surprised if they listened to Guy's debut recording as a leader from 1968. A Man and the Blues (Vanguard) lacks much of the over-the-top histrionics present in most of Guy's solo work since the 1980s. In its place on his debut is a barely contained passion that makes it seem as though Guy might explode if he weren’t able to find a release. Guy's guitar work is simply magnificent here, a textbook example of how the Blues ought to be played. There are no Hendrixian, turn-it-up-to-ten sidesteps here, just a tasteful, almost liquid tone that will leave you speechless at times. In addition, there's little of the usual screaming, almost hysterical vocals that are usually present. Guy sings in a style that is subdued, yet bursting with passion at the same time. The band backing Guy on this session is without a doubt one of the best Blues bands ever assembled, and one of Guy’s favorite lineups, with Wayne Bennett on rhythm guitar, Jack Myers on bass, the trio of Bobby Fields, Donald Hankin and Aaron Corthen (A. C. Reed) on sax, and Lonny Taylor and the great Fred Below sharing time on drums. Granted, a couple of the tracks sound a bit dated nearly 40 years after being recorded ("Just Playing My Axe" and "Jam On A Monday Morning"), but most of these songs stand the test of time pretty well. Guy wrote several of the selections, including the title track, a standout slow blues and the playful "Mary Had A Little Lamb," which will be familiar to Stevie Ray Vaughan fans. He also tackles a couple of songs from the B. B. King set list. His cover of "Sweet Little Angel" is the version of that song that you absolutely have to hear if you're a Blues fan. Spann's accompanying piano is awe-inspiring and Guy's performance is one of his best. "Worry, Worry" is almost as impressive, as is a cover of Mercy Dee Walton's "One Room Country Shack." Guy’s subsequent releases for various labels may have had more fireworks, but none of them have possessed the beautiful subtlety of A Man And The Blues. 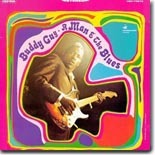 Until you’ve heard it, you haven’t heard all there is to hear from Buddy Guy.